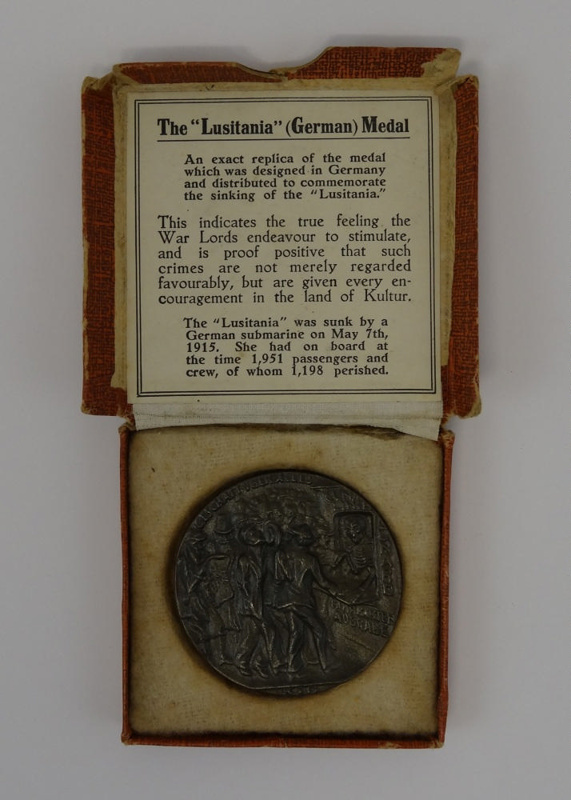 German Medal (Replica): Commemoration of the sinking of the ship "Lusitania". WWI. R.M.S Lusitania was sunk on her return journey from the United States by a German submarine on May 7th, 1915. The 32,000 ton ship had 1,951 passengers and crew on board, of whom 1,198 perished. This is an exact replica of the medal which was designed and distributed in Germany to commemorate the sinking of the ship. Such replica were made by the British and used for propaganda purposes during WWI. 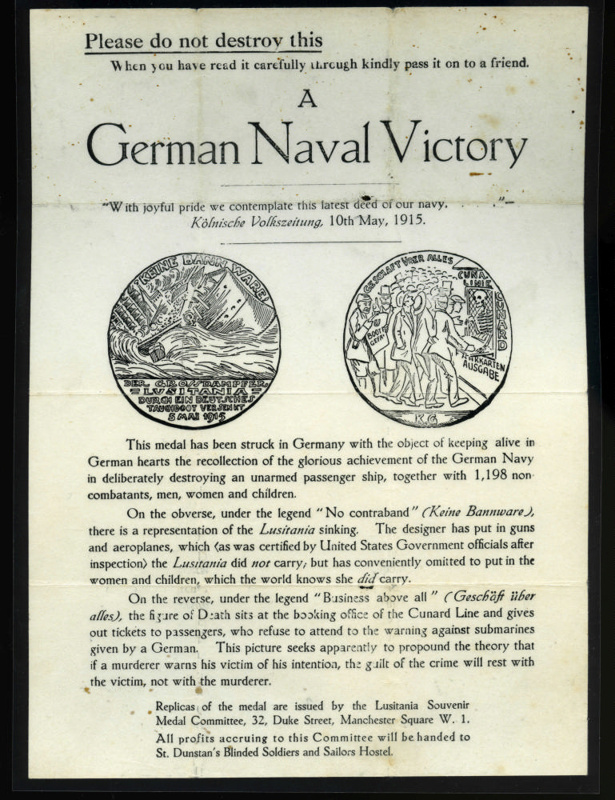 The German medal was created by German artist, Karl Goetz, who was incensed by the idea that a passenger liner might have been used for military purposes. The British replica was made and distributed in Britain to protest against the German use of medallic art to celebrate the tragedy. The British copy came in its own presentation box and had documentation which included the reasons behind its production. 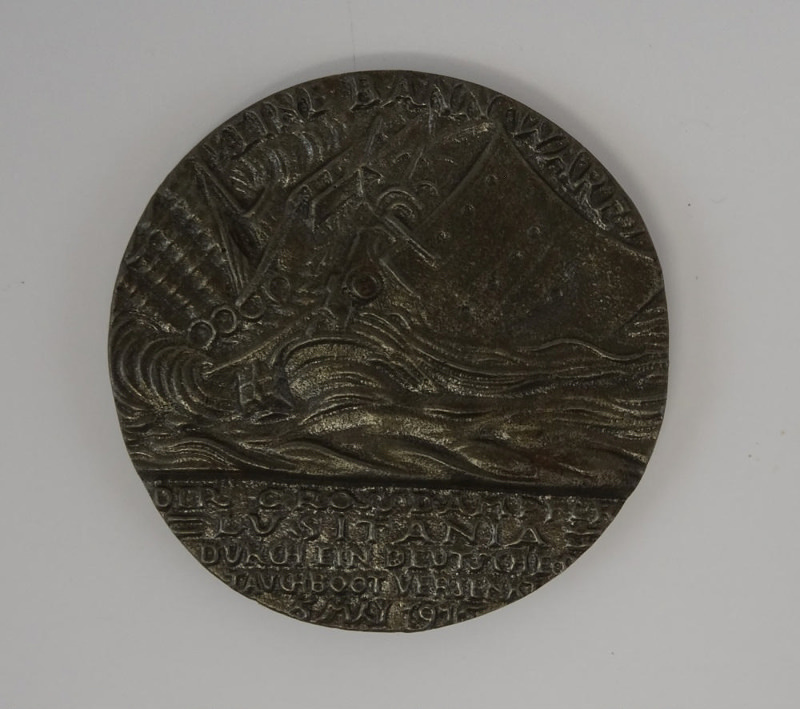 On the obverse of the medal under the legend " No contraband" (Keine Bannware), there is the representation of the Lusitania sinking under the waves. There are weapons shown on the deck which is a direct accusation that the ship had been carrying munitions and therefore risking the passengers lives. The reverse side, under the legend "Business above all" (Geschaft uber alles), depicts a scene of unsuspecting passengers waiting in a queue to buy tickets from a skeleton (the personification of Death). The warnings of a German man in the background and a newspaper headline about the dangers of the U-boat are ignored by the crowd. Iron, paper, cardboard, fabric. 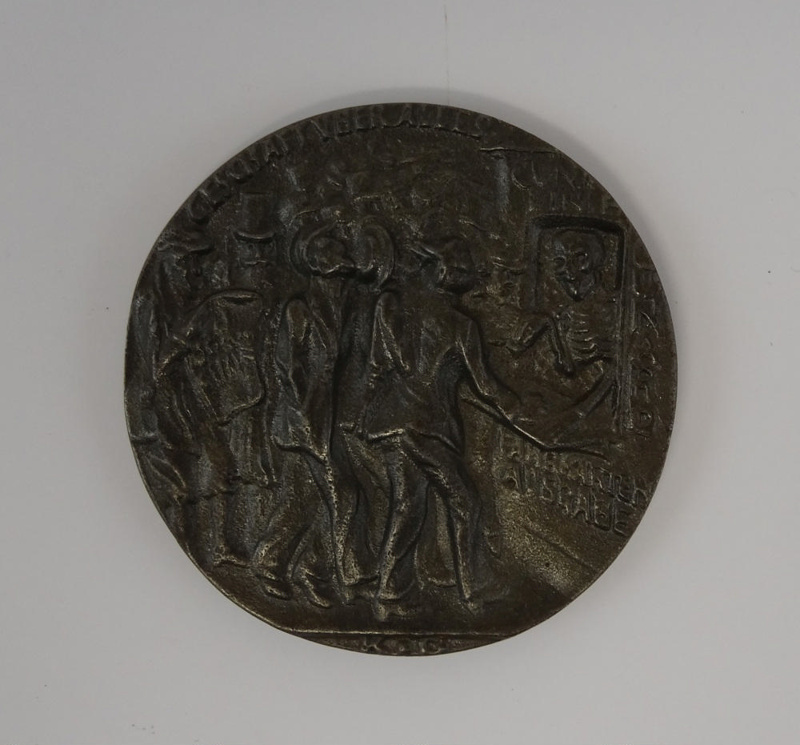 The medal is grey in colour and is heavily inscribed with scenes on either side (as described above). It comes in a velvet lined cardboard presentation box and is supported by explanatory documentation. 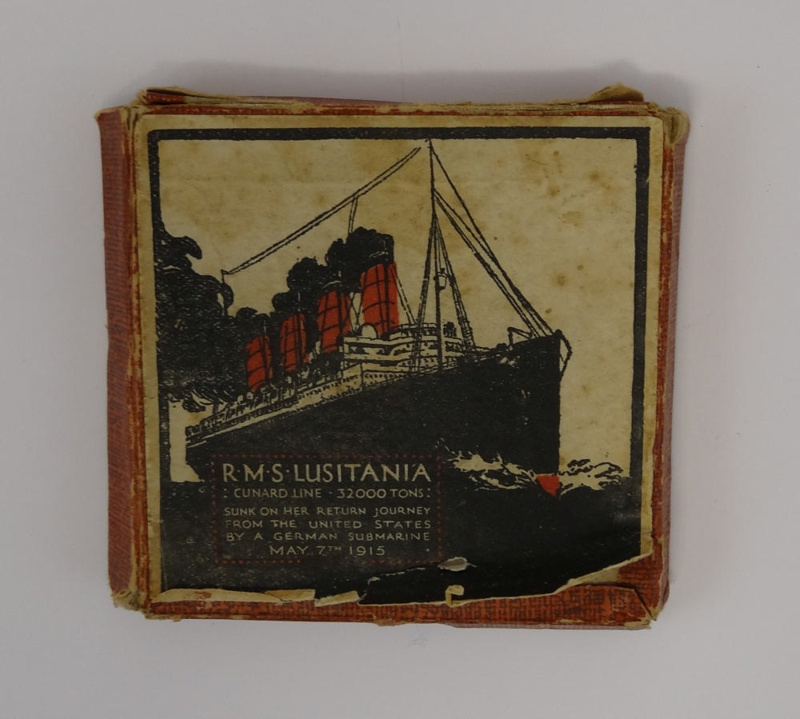 The cardboard presentation box has a picture of the Lusitania on the front with the following words; 'R.M.S. Lusitania, Cunard Line, 32,000 tons, sunk on return journey from the United States by a German submarine, May 7th 1915'. Details regarding date and number of fatalities and survivors is also included. The presentation box is 8cm (length) x 8cm (width) x 1cm (height).